Sitemap, as the name suggests, is a map of a website so that search engines can locate and index website content with ease. It is a page or file that contains listing of your website pages. Sitemap is an important requirement in the process of submitting your website to Google or Yahoo. With proper sitemap, Google (Bing, Yahoo) will know your website content in a better manner and as a result will send more traffic to your website. Here are few ways to create sitemap for your website or blog. 1. XML-Sitemaps – Enter full website URL and some optional parameters in the web based form. 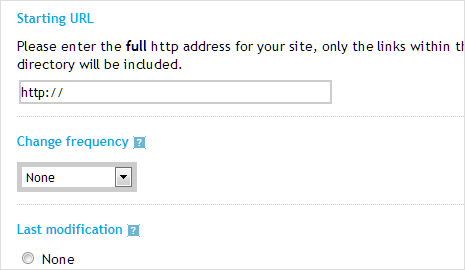 Then press ‘Start’ button and wait until the site is completely crawled. You will see the generated sitemap details page, including number of pages, broken links list, XML file content and link to a compressed sitemap. 2. SitemapDoc – Enter the base URL of your site and click ‘create map’ button. The page will refresh with a list of the pages from your site. Any pages that could not be loaded will be flagged. Uncheck pages you do not want to include. 3. FreesitemapGenerator – First you need to create an account and add your website. Just enter the homepage url of your website. Whenever you want to generate a sitemap press the make sitemap button on the control panel page. 4. ScriptSocket Sitemap Generator – In web based form: enter website URL, frequency on how often Google spiders visit your pages, set priority, last modified date and then hit the generate button. 5. GSiteCrawler – It helpes you generate Google Sitemap file for your website. This Windows (95,98, ME, 2000, XP, 2003 Server) supported tool is free for download and use. 6. Sorrowman Sitemap Filter – It is a free windows tool for picking/filtering certain URLs off from google sitemap XML files and submitting sitemaps to google. 7. Rage Google Sitemap Automator – (OSX) It allows you to create XML Sitemap files that tell search engines all about your website including which pages to index, how often to come back for fresh, new content, and how important each page on your website is. 8. Site Magellan [sitemagellan.com – not available] – It is a powerful and free Google sitemap generator and sitemap editor. Use Site Magellan to quickly create and edit ASP.NET and Google sitemaps. 9. VIGOS Gsitemap [vigos.com/products/gsitemap/ – not available] – It is a free, easy to use Windows sitemap generator tool to help webmasters and website owners to create, edit and submit sitemap information in adherence to the Google Sitemaps protocol. 10. Sitemaps Generator for WordPress – This plugin generates a XML-Sitemap compliant sitemap of your WordPress blog. This format is supported by Ask.com, Google, YAHOO and MSN Search. Very simple and easy to use. 11. Plugin for Coppermine photogallery – Run this script from your server to create an xml file with info about your site that is then used by search engine crawlers. 12. DreamWeaver plugin – This plugins allows you to generate an xml sitemap of your whole site that you can submit to google for better indexing. 13. Drupal XML Sitemap – It automatically creates a site map that conforms to the sitemaps.org specification. This helps search engines keep their search results up to date. 14. TypepadBot for TypePad Blogs – It creates Google XML format sitemap for your TypePad blogs. Typepadbot uses Atom API to communicate with the blog server, and asks for a list of every single entry in your blog. It is always better to use a plugin or module of related CMS or blogging software that your website or blog uses. In case it is not available, go for online or downloadable options to create sitemap. Nice list ! But Big problem is there for Blogger Users like me !! Blogger Users can’t upload that sitemap ! Hence , these services are not of any worth for us ! Please update your post and add these too …as beginners are always @ Blogger !